The barn red wainscot and yellow walls make this a bright and cheery room. 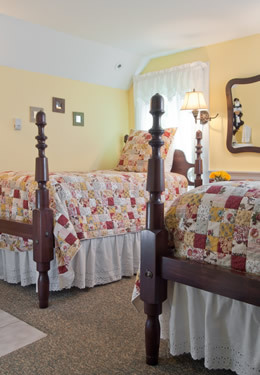 With two single beds, this is a favorite for individuals traveling together who each prefer their own bed. A pedestal sink is located within the bedroom while the private toilet and shower are behind a sliding door. The Primrose and Coral Bell rooms are the only ones on this ground level. Located at the back of the inn, it is easily accessible from the rear of the house. It is also convenient for those having difficulty with a lot of stairs. The dining and living room are located on the next level. 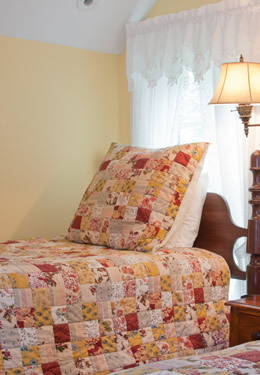 A quiet covered porch is situated just outside this room.